Iceland lies about 1,000 km west of Norway and 300 km southeast of Greenland. It is encircled by the Denmark Strait, the Norwegian Sea, and the Arctic and Atlantic Oceans. Iceland is located on a volcanically active region of the Mid-Atlantic Ridge. Volcanic eruptions have created vast uninhabitable lava tablelands with mountainous outcroppings. Elevations in the uplands, which cover about half the country, average from about 610 m to 915 m. Hvannadalshnúkur (2,119 m), in the southeast, is the highest summit. Snowfields and glaciers cover nearly 15% of Iceland’s surface. Vatnajökull, a glacier in the southeast, has an area of 8,456 km². Iceland has numerous small lakes and many swift-flowing rivers broken by dramatic waterfalls. Iceland’s coast (total length of 4,988 km) have many bays and fjords, except in the south, where the shore is mostly sandy. Three large peninsulas jut out from Iceland’s west coast. The most prominent is Vestfjarda Peninsula. None of the rivers is navigable, but many hold significant waterpower potential. Lowlands in Iceland are situated mainly along the southwestern coast. Lowlands occupy about 25 % of the country. Most of the Icelandic population lives along the coast, particularly in the southwest. Iceland is remarkable for its numerous volcanoes, craters, and hot springs, and for the frequency of its earthquakes. More than 100 volcanoes, including at least 25 that have erupted in recorded history, rise on the island. In 1963 a volcanic eruption off Iceland’s southern coast created the small island of Surtsey. Among Iceland’s best-known volcanoes are Hekla (1,491 m), which has erupted many times, and nearby Laki, with about 100 separate craters. Many eruptions have caused widespread devastation, including the 1783 eruption of Laki in which more than 9,000 Icelanders died. Where ice fields overlay volcanoes, the latter sometimes erupt through the ice, causing spectacular ice explosions. Hot springs rise to the surface across Iceland. Particularly numerous in the volcanic areas, the springs occur as geysers (a word of Icelandic origin), as boiling mud lakes, and in various other forms. 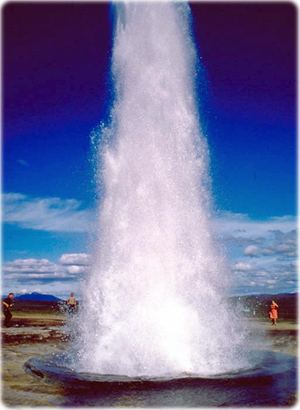 The famous Geysir in south central Iceland, the oldest geyser in recorded history and generally regarded as one of the most spectacular, erupts at irregular intervals, ejecting a column of boiling water up to about 60 m in height. Most homes and industrial establishments in the Reykjavík area are heated by water piped from nearby hot springs. Copyright © Geographic Guide - European countries.